Part of the Society Islands of French Polynesia, Bora Bora is an island in the Leeward group in the Pacific Ocean. This mountainous island is located at about 230 kilometres northwest of Papeete. It has Mount Otemanu and twin-peaked Mount Pahia as its highest peaks; peaks of black rock which are the remains of an extinct volcano in the centre of the island. The often lushly vegetated mountains drop to narrow coastal strips or directly into a lagoon or the sea. Bora Bora is surrounded by coral reefs, and on the west side of the main island is the large lagoon in which the smaller islands of Toopua and Toopuati protect a spacious harbour, popular with yachtsmen. 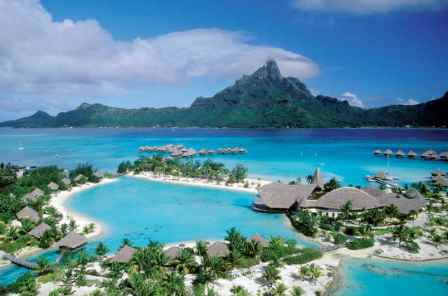 Bora Bora's lagoon is its most treasured feature. All these peculiar characteristics together give as a result an impressive landscape. 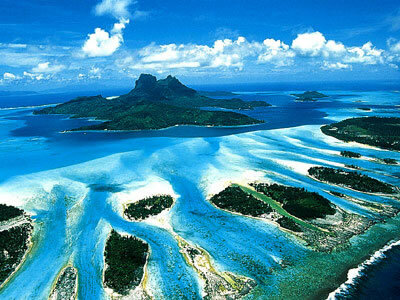 Bora-Bora comprises the island of Bora Bora together with the surrounding islets that come out from a huge coral reef and the atoll of Tupai, located 20 kilometres north of Bora Bora. The islets that surround Bora Bora are Motu Tapu, Motu Ahuna, Tevairoa, Motu Tane, Motu Mute, Motu Tufari, Motu Pitiaau, Sofitel Motu, Motu Toopua and Toopuaiti. The islands are protected from the force of the sea by almost completely encircling barrier reefs. 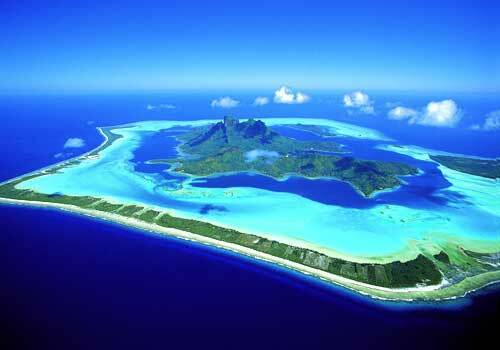 The permanent population of Bora Bora is 8,880 inhabitants according to the 2008 census. Vaitape, the principal village and administrative centre of the commune, is on the western side of the main island. The commune is in the administrative subdivision of the Leeward Islands divided into 3 districts: Vaitape, Faanui and Anau. The economy of the island is mostly limited to what can be obtained from the sea and the plentiful coconut trees, which have historically been of economic importance for copra, though tourism is Bora-Bora's primary industry. Bora Bora is a world known tourist destination famous for its luxury resorts, many of them built on small islands or motu around the lagoon. Nowadays the island mostly depends on tourism. Over-water bungalows on stilts over the lagoon are a one of the main characteristics of most Bora Bora resorts. Among these bungalows you can find from comparably cost-effective basic accommodations to very well-appointed and high-priced places to stay. Most of the tourists that visit Bora Bora come from the United States, Japan and Europe. Even though French and Tahitian are the main languages spoken by the inhabitants, people in contact with tourists generally have some command of English. Regarding transportation, Bora Bora Airport, on Motu Mete in the north, provides about six daily flights to and from Papeete on Tahiti. Rental cars and bicycles are the recommended means of transport in the island, as there is no collective public transportation. There are also small fun-cars that you can hire in Vaitape. World known for its marvellous beaches, transparent blue waters and its ideal tropical climate, Bora Bora has everything you need. Water sports, excursions, relaxation and adventure that include shark and ray feeding, deep-sea and sport fishing and parasailing are, among other activities, some of the entertainment options you will find in this superb place. When considering things to do in Bora Bora you will be surprised due to all possible activities, excursions and sports you can enjoy here. Bora Bora is also the perfect setting for a unique wedding, an idyllic honeymoon or a romantic getaway. Tahitian weddings and renewing wedding vows using interesting traditional Tahitian methods are also popular activities. Temperature 26 - 33°C (72 - 86°F).